In 2007, a fourteen-year-old schoolboy was working for his Bronze Award. As part of his service to the community, cricket-mad Ross McCreath decided to help teach a bored group of township boys how to play the game. Ross took his cricket kit and his coaching skills to a cow-pat strewn field on the edge of Nolukhanyo Township outside Bathurst and something amazing happened. Cricket brought together a community that had more of a reputation for drug misuse and crime than sport. The Tiger Titans Cricket Club now has a squad of nearly 100 members, between the ages of nine and 19, who make up seven teams. Facilities are basic. The club has a milk wood tree as their club house, the outfield is bumpy, and they need to chase cattle off the pitch before a game. But their results are impressive. Within months, they beat Ross’s own school team and then established a winning record of over 80% against private and public schools in the province and further afield. About a third of the squad have also enrolled on the President’s Award for Youth Empowerment, the South African member programme of the Duke of Edinburgh’s International Award. 28 of them achieved their Bronze in September 2011 (an impressive 84% completion rate) and they have all enrolled for Silver. Of the remaining five, four of them need to complete their Adventurous Journey (which they will do later this year), as they had to go through a Xhosa cultural initiation process, when the rest of the group did their expedition. Last week, Ross and Masixole Mkrakra, the current team captain, travelled to Lord’s Cricket Ground in London to speak to a group of supporters of the Award. Both boys proved to be truly inspirational public speakers and amazing ambassadors for both the Award and for South Africa. “Good evening, or in Isi-Xhosa – MOLWENI! Being here tonight … is like a dream to me. I still cannot believe it. I am from a rural township in South Africa and I have been playing cricket for 4 years. Here I am standing in front of you at Lords. It is an honour beyond my biggest dreams. I am a proud Silver Award participant and a proud member of the Tiger Titans Cricket Club. They have both changed my life in so many ways. The beautiful land that I see from my home is farmed with pineapples and cows. But all this beauty does not hide the big problems in my community. There are many problems: unemployment ;alcohol and drug abuse; HIV/AIDS and extreme poverty. My father passed away when I was 3. My mother, when I was 13. I went to live with my Grandmother – my GOGO – together with 8 other family members, in a small government house of 50 square metres. My GOGO passed away in 2010 and my aunt – Nomalungelo Ngesi – took us all in. She is a farm worker and is the only one who provides for us. I am very thankful for her big heart. Life for young people in the township has little to offer. Our schools do not provide us with any after school activities. Children often play in the streets, and the older ones get involved in bad things. Many young people of my age get involved in crime; they drink; they have nothing to do; they have no role models. Many of the traditional African values are slowly disappearing because so many of us do not have parents to guide and support us. If I think back, I was becoming one of those boys. In December 2007, I heard from Duzi Mkalipi – a young man in the township, that a white boy called Ross, had started teaching township kids how to play cricket. We were asked to join in. I thought to myself … Eish!! – a white boy… here ? … in the township?… This I have to see…! It was on a Wednesday afternoon, when I walked across the road from the township to where a field had been cleared of bush, and there I saw this real white boy. He was playing cricket with 30 township boys of all ages. There was a lot of laughing, running around and games being played. Everyone was having fun and I joined in. I had never done any activities with a white person before. It was very strange to me. But I really enjoyed myself and could not wait for the next day to take part again! Over that holiday, I learnt so much about myself from Ross and Duzi. I could not wait to get to the cricket field where I had no worries and where all of us were learning something new. I made new friends and found that I really enjoyed this game called Cricket. I found happiness and a reason to be excited. It was very funny hearing Ross trying to speak our language and trying to remember our names. He found it difficult so he just made up some new ones…we laughed a lot! 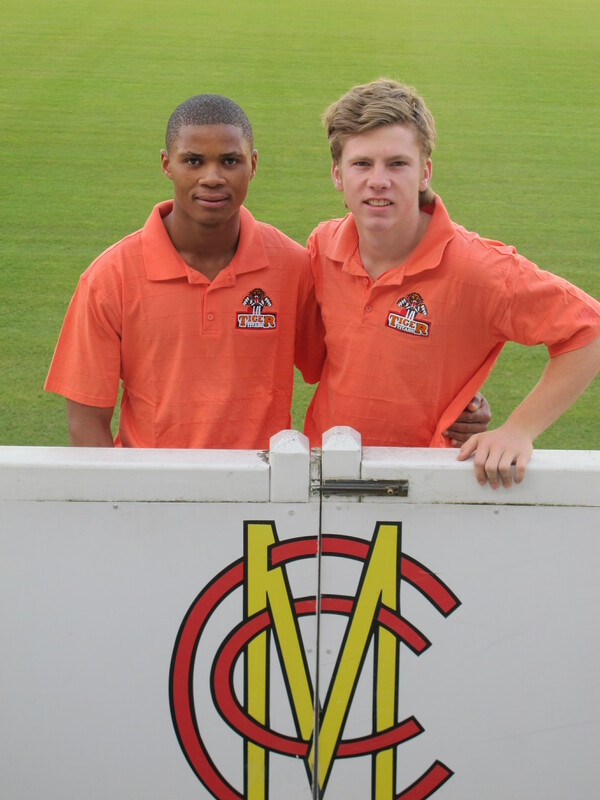 In January 2008, Ross organised the Tiger Titans Cricket Club’s first match against his school – St Andrew’s College in Grahamstown. I was not selected for the team and was upset. I really wanted to wear the smart new white cricket clothes. I wanted to travel with the team to a beautiful school and play on a beautiful cricket field. When the team returned by bus that evening, they were singing and dancing. We had won our first match. I knew I had to work hard to be chosen for the next match! The news about Ross and the Tiger Titans spread and soon we were all being interviewed by newspaper and television reporters. We were on television and in the newspapers. But the best feeling I had was when I was chosen to play in the next match… I will never forget pulling on those whites and walking onto the field. And when Mark Boucher, the South African wicket keeper, sent us a few items of his personal kit – including his green wicky pads – I decided that I wanted to be a wicky. I wore his pads in that first match – WOW!!! It was the happiest day in my life. The Tiger Titans has become like my family, and we all look out for each other, and do things together. This has been a big change for me. In 2010, Ross spoke to us all about The Award Programme. Mama Tiger – Ross’s mother – arranged for a Gold Award Holder – Xolile Madinda – to come and speak to us about the Award Programme. 33 of us made one of the BEST CHOICES of our lives. We enrolled for the Bronze Level. We did our Bronze hike in the beautiful Hogsback Mountains. It was one of the best things I have ever done… There, I learnt about the environment; I faced my fear of heights; I hiked in the dark; I learnt to trust in my teammates. Camping was a new experience for me! For Skills, I did the Cricket South Africa Level 1 Coaching Course. This has given me the chance to coach our younger players. I also passed the St John’s First Aid Level 1 exam…. I plan to complete the next levels for both these skills, for my Silver Badge. For the Service Section, we did many litter clean-ups; we fixed up a playground and planted trees; we cleaned up the local cemetery. All of us have family who are buried there, and to see the big difference we made, made my heart very happy. For the sports section, I play CRICKET, of course!!! We wear our Award shirts whenever we can I am proud to tell everybody about the Award and what we do. The Award has given me the chance to see that I am able to make a difference to my own life and in my community. I have overcome many fears. I have made new friends. I have learnt new skills. I have found that I can be a leader, a helper, a teacher, and a positive influence in my community. I am proud of who I have become and am grateful for those who have helped me to make the right choices! John – wonderful that you are giving publicity to these remarkable young men! What a privilege to have heard them speak. John, you were right what a read! I believe that this award is a great way to let young people make there impact on the world and be recognised by it! I will enroll today! keep up the goood weork my friend, this is very nice you allmost made me cry.